On Tuesday, major automakers reported higher sales for new vehicles for March thanks to a strong economy in the U.S. and large consumer discounts, helping to send shares in automakers up in trading. General Motors posted a jump of 16% in sales of new vehicles compared to March of 2017, led by an increase of 14% in consumer sales that are higher margin. Fiat Chrysler said its sales increased 14% during March and announced a spike of 45% in its highly popular Jeep brand, giving that brand its best month for sales on record. The strong March results followed a weak February. In 2017, auto sales dropped by 2% after they had reached a record high in units for 2016 of 17.55 million. Estimates are that sales will fall further during 2018, as rates for car loans increase making the monthly payment higher. In addition, millions of close to new cars will be returning to the market in 2018 after ending leases, providing consumers with an alternative at a lower cost. GM posted sales increases in the double digits for all its brands during March, with strong gains in particular for its pickup truck and SUV models. Kurt McNeil the head of sales for the U.S. at GM said March was a great month as the economy continued to grow and popular new products helped the company execute a successful plan to win over customers from other brands. The No. 1 automaker in the U.S. said earlier on Tuesday that it would no longer report its monthly vehicles sales in the U.S., saying that the snapshot of 30 days does not reflect accurately on the market and will now only issue its quarterly sales. No other automakers said if they too would be stopping sales reports for 30 days. In addition, GM said that during March it lowered dealer inventory of its unsold vehicles, an important metric, from 85 days to 72 days. However, while GM said the average price per transaction was up by $900 during the first quarter, the consumer discounts by the company as an overall percentage hit 14.5% during the month of March. Industry analysts look at discounts higher than 10% as unhealthy as they undermine the resale values and eat away at profits. 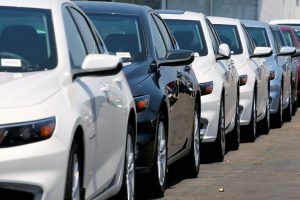 When issuing their March sales forecast a week ago, auto industry consultants said that industry wide discounts during the first half of March reached 10.2%.